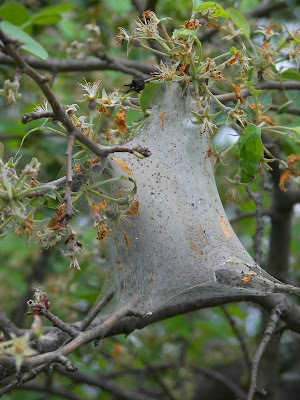 (Romulus, MI) Pictured on your left is the communal web (or massed cocoon) of the Orchard ermine, a moth that produces larvae that can be rather destructive on trees. As the larvae mature, they turn into caterpillars that feast on the leaves of the tree to which they are affixed (in this case, an apple tree). As a kid I used to creep out my sister by chasing her with a pulsating section of soon-to-be-free caterpillars. I suspect that I did not earn positive karma with these actions.